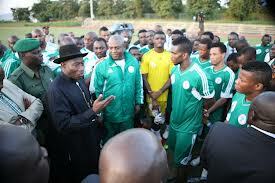 Nigerian President Goodluck Jonathan watched the country’s team train on Wednesday and then charged them to win in Liberia on Saturday. 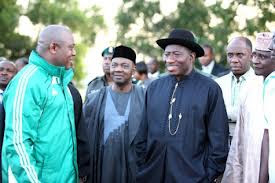 President Jonathan, who had earlier called coach Keshi on Monday, gave the charge on Wednesday when he paid an unscheduled visit to the Eagles during their evening session ahead of a 2013 Nations Cup qualifier in Monrovia. The President who was in the company of Vice president Namadi Sambo and Ministers of Sports, FCT and Finance including the chairman of governors forum Rotimi Amaechi, who is the governor of Rivers State, expressed confidence in the ability of the Super Eagles. "From what I have seen from your training, I am confident that you would make Nigerians proud this weekend in Monrovia,“ the President said. The President, who declared his intention to watch the 2013 AFCON finals in South Africa, told the Eagles that it can only be possible if the Eagles put Liberia aside. "I want to be in the Nations Cup in South Africa but that cannot happen if you do not beat Liberia to qualify. All what you need to qualify and we will provide for you. 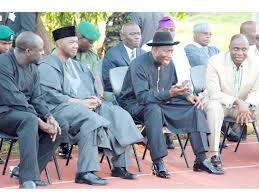 So, I charge you to go out and qualify this country for the Nations Cup," Jonathan added. Eagles coach Stephen Keshi thanked the President for visiting the team, saying his personal interest will further galvanise the team to win in Monrovia on Saturday.